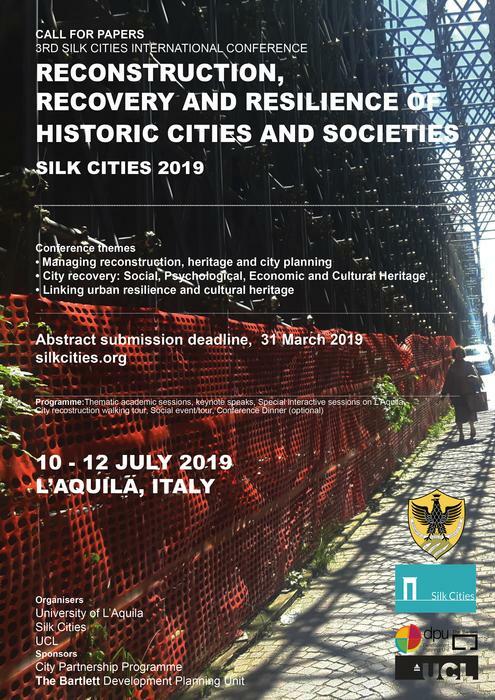 "Reconstruction, Recovery and Resilience of Historic Cities and Societies"
2019 marks the tenth anniversary of the L’Aquila earthquake which devastated the city and its historic centre, affecting over 100,000 people who lived in the city and its surrounding areas. While rebuilding work is ongoing, economic and social recovery is struggling. The conference aims to bring together global knowledge and offer new perspectives and strategies on linking urban processes, reconstruction approaches and heritage issues and to push the traditional theoretical and practical boundaries in order to improve the future of post-crisis reconstruction in historic cities. The city and its people stand to benefit from the global, dispersed, knowledge on the subject matter that will be gathered in the city during the conference. In a post-disaster situation, the interrelation of historic urban context, cultural heritage, social, psychological and economic factors presents a highly complex scenario for decision makers, practitioners and affected local populations. This is a matter of increasing international concern which has been highlighted by recent disasters of both natural and human origin. The conference themes of reconstruction, recovery and resilience relate both to the protection, reinstatement and restoration of built and historic urban fabric and to the broader but related issues of social cohesion, intangible cultural heritage and psychological wellbeing. Beyond the repair of monuments, the dynamic layers of urban heritage greatly complicate the already complex matter of urban reconstruction and retrofit, and impact on initial expectations as well as envisioned improvements from reconstruction activities and the way they are managed. The focussed, multidisciplinary approach of the conference relates to the UN Habitat III agenda, the Sendai framework on disasters and resilience and the themes of the International Committee on Monuments and Sites [ICOMOS]. The conference is designed to address the issues surrounding reconstruction in historic cities at two levels. At a local level the conference will provoke conversation and reflection on the rebuilding work already carried out and consideration of the next ten years of reconstruction and recovery in L’Aquila. At a wider level, the conference seeks to influence the way in which risk is considered in historic cities and to promote a holistic approach to resilience which takes account of social, cultural and psychological factors. The three day conference will be part of the series of events marking ten years from the earthquake, open to all it will encourage participation from the citizens of L’Aquila. Round table discussions are planned which will bring academic participants in the conference together with policy makers, local activists and other stakeholders to look at strategies for recovery and resilience. The city and its people stand to benefit from external insights and knowledge and it can be seen as a laboratory to examine themes that are common to many cities worldwide. Conference themes vertically address three interconnected notions of reconstruction, recovery and resilience, and horizontally they are stem from the particular circumstances of the host historic city that nevertheless are also applicable in other cases of post-crisis reconstruction of historic cities, such as protection, reinstatement and restoration of built and historic urban fabric and to the broader but related issues of social cohesion, intangible cultural heritage and psychological wellbeing, information technology, communication and transparency and the linkages between reconstruction and urban development. The conference also welcomes non-paper presentations, for example short films and documentaries. You should submit your abstract through an online system. Create an account in that system first and make sure you type your email address correctly. The system will send you an email with a link to verify your email and complete the account creation. Abstracts will be reviewed by the Scientific Committee . The Conference uses blind review process. Thus you should upload an anonymous abstract to the online system. Make sure that the uploaded file doesn't include author's name and/or institution. If you are interested in other forms of presentation, for example, a short film and so on, please clearly mention it in your abstract. Delegates will need to register in advance. Accepted papers must have at least one registered author in order to be considered for the conference final programming and publication. All attendees must register and only registered authors/attendees will receive a certificate. Late registrations are subject to availability of places only for attendees. Registration for authors and paper presenters will open after notifying authors of the outcomes of peer review feedback on submitted abstracts. Registration fees are as follows. Registration will open in early Aprll.